I’d planned to write this blog-post in time for the first day of the Chinese New Year, which fell on February 16th this year. Alas, I succumbed to flu a few days before the Year of the Earth Dog commenced. This year’s viruses seem especially virulent. I was told that ‘Australian flu’ was doing the rounds in London. I love this. No doubt when my friends down under get really sick, they blame it on ‘Pommy flu’. At last, the effects of the virus are receding and I can start thinking again about food! I ended 2017 on a petai note, so it seems only right to begin 2018 with that other potent Malaysian product: the durian. Without doubt, this is the king of Malaysia’s fruits. 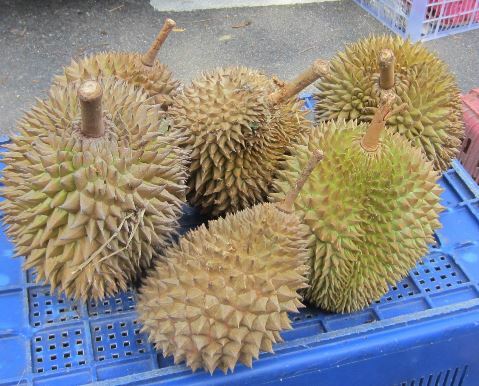 Here’s a picture of durians below. Each fruit is covered by a hard, spiky, olive green husk that gives it an almost prehistoric appearance. Durians are not innocuous-looking. Even T Rex wouldn’t want to mess with them. Each fruit contains six to twelve or more seeds, and each seed is covered by soft flesh. It’s this gooey flesh that is coveted by durian connoisseurs. The flesh is yellow to off-white in colour and turns to pulp in your fingers. ‘Durian’ could refer either to the whole fruit or to each of the individual flesh-covered seeds inside. If you know your durians, you can tell by looking at the colour and texture of the flesh whether it’s your favourite type or not. 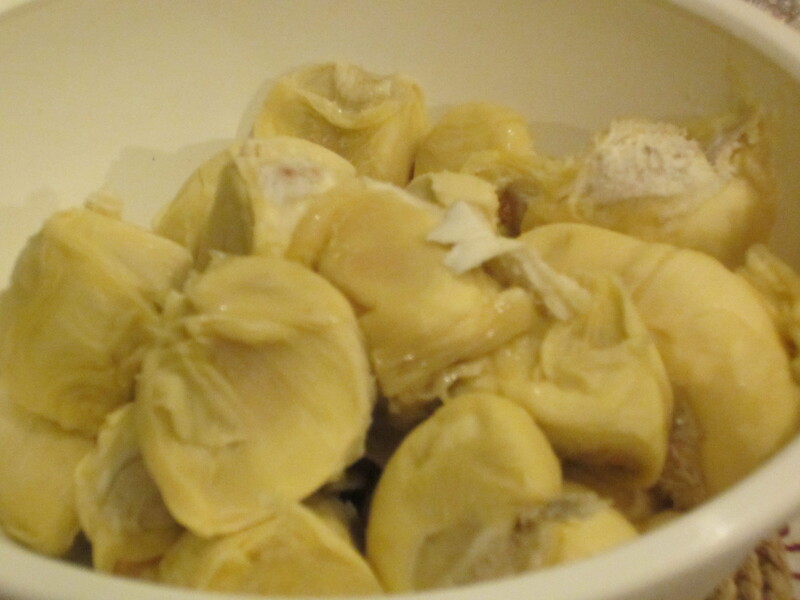 I like durians with dry, bright yellow flesh (see picture below) because they tend to be the sweetest. Others prefer the slightly wet, somewhat bitter variety of durians. Once the green durian husk has been split open, there is no getting away from its pervasive aroma. In this respect, durians are a lot more potent than petai. Comparing durians to kissing a corpse? I think that’s rather unfair. It’s akin to saying that France’s famous Reblochon cheese has the stench of milk gone very bad – which it has – or to early Japanese perceptions that Westerners all smelt of cow. A few years ago I discovered that I was lactose-intolerant, since when I’ve avoided dairy products, and having stopped eating dairy, I can assure you that animal milk smells terrible, even when it’s supposedly fresh! In fact, there is an untranslatable Chinese word to describe the smell of milk. This Chinese word, which is cow-related, conjures up a food that is both bad-smelling and unsavoury. In bygone days, you were forced to buy durians still in their husks from roadside vendors. These had to transported home in the boot of your car. Everyone would be salivating during the journey because there was no way of escaping their delicious aroma. And then, when you finally reached home, you still had the work of breaking the durians open. Now durians are sold peeled and ready-to-eat, in white plastic containers. See how easy life has become? While I was on a visit to Malaysia last year, my uncle bought several containers of durians and we stashed them away in the boot, taking care to wrap the containers inside not one but two plastic bags. In spite of these precautions, we could still smell the durians from inside the car! This is why hotels across Southeast Asia have signs reminding people that durians are prohibited inside. Despite this, there is more hope of durians finding their way into world cuisine than petai. Durians have long been used in cakes (a type of Malaysian delicacy aptly called durian cake), as well as in ice cream and ice lollies. Recently durians even made an appearance in coffee! Here they are, on packets advertising the white coffee for which my hometown, Ipoh, is famous. Just in case you doubted our language abilities, the coffee is marketed in French, okay? Durian café blanc. 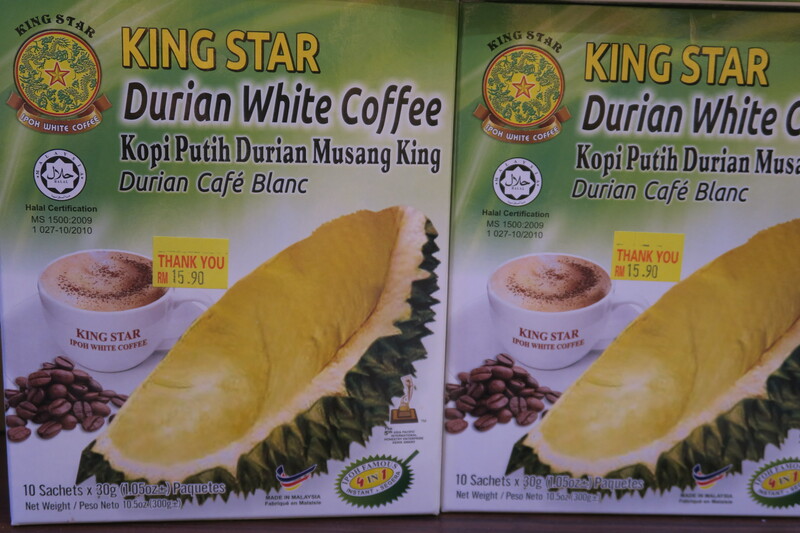 I have to mention the type of durian used to flavour this coffee: it’s the famous Malaysian variety known as ‘Musang King’. (In Malay, musang is a civet cat.) 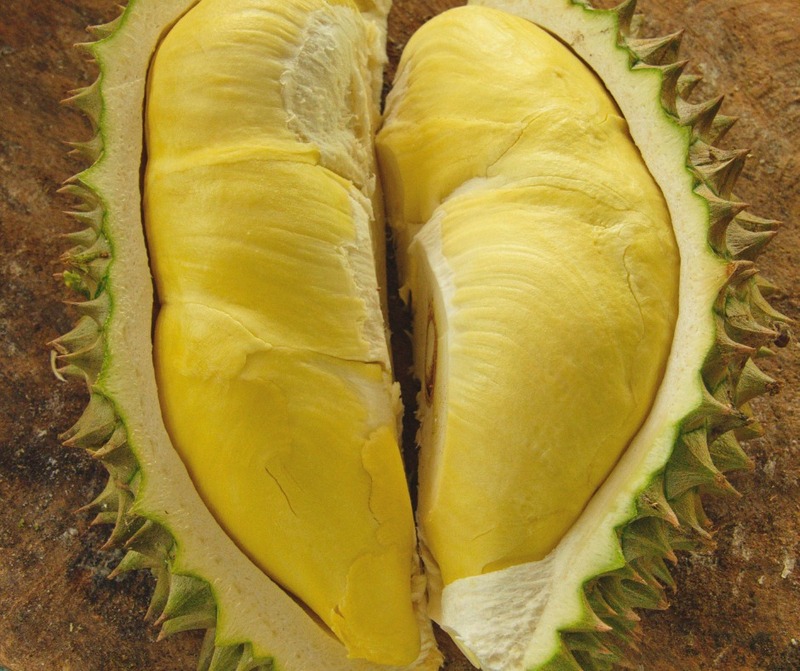 In 2014, when the Loon Fung supermarket on Gerrard Street in London’s Chinatown started selling Musang King durians, this was such an event that even the Guardian newspaper reported it. And last year, the first Musang King Durian Festival was organised in Malaysia. The festival may yet become an annual event. So beware folks, the Musang King might soon be coming to a place near you!